viaLibri ~ PAIR OF AMBROTYPES, CASED TOGETHER, FEATURING A MINISTER AND HIS WIFE]. 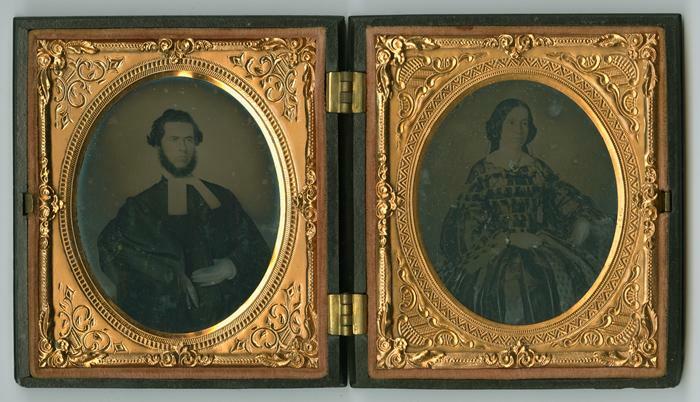 PAIR OF AMBROTYPES, CASED TOGETHER, FEATURING A MINISTER AND HIS WIFE]. [N.p. ca. 1855]. - Two sixth-plate ambrotypes, each in oval frames measuring 3 1/2 x 3 inches, housed together in a thermoplastic Union case. Minor degradation to the man's image, else very good. An attractive pair of ambrotypes featuring a married man and woman around the middle of the 19th century. The man sports a donegal beard and is wearing clerical bands; the woman is decked out in a flowing dress with large sleeves.